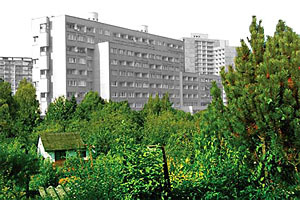 Dreer Award recipient Christopher Keil (MLA 2009) will report on his half-year horticultural adventure in Eastern Europe, Monday, May 3, 2010, 12:15pm, 461 Kennedy Hall. The Frederick Dreer Award, allows one or more students to spend 6 months to a year abroad pursuing his or her interests related to horticulture. 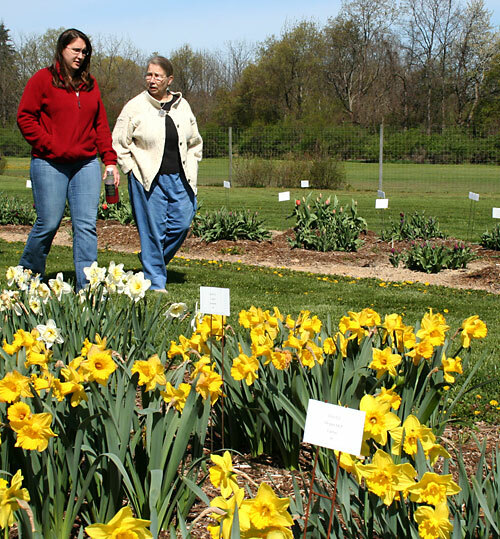 CALS Dean Susan Henry and her husband Peter were among the 125 visitors attending the open house at the Bluegrass Lane Turf and Landscape Research Center on Saturday, April 24, walking the flower bulb labyrinth and viewing research plots. 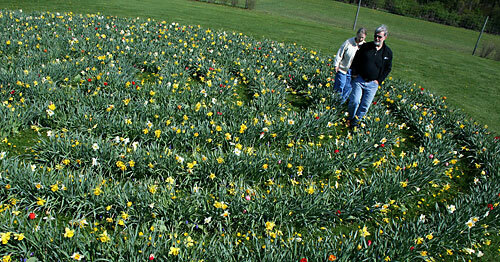 Dean Susan Henry and her husband Peter walk the flower bulb labyrinth. Flower Bulb Research Program research support specialist Melissa Kitchen shows Dean Henry bulb research trials. Melissa Kitchen shows Dean Henry bulb research trials. Bluegrass Lane is not open to the public, but more open houses will be scheduled for later in the season. More information about the flower bulb labyrinth. Marvin Pritts was named the 2010 recipient of the CircleLink Award in honor of outstanding advising, teaching and innovative programming in the College of Agriculture and Life Sciences. Christine Hadekel was selected for one of the 2009-2010 Student Employee Recognition Awards from the Office of Financial Aid and Student Employment, The Cornell Commitment, and the Office of Minority Educational Affairs. Christine works in the Department’s Garden-Based Learning Program. The Small Farms Program is seeking a Summer Intern to assist with organziation and outreach in 2 key program areas: Farm Energy issues and Beginning Farmer issues. The intern must be outgoing and have strong writing, editing, organizational and outreach skills. Coursework or focus in journalism, multimedia, or ag communications is preffered. Must have some background in farming and an enthusiasm for learning more about small farms in NY. Term of Employment: May – August, 2010. Start and End date flexible. 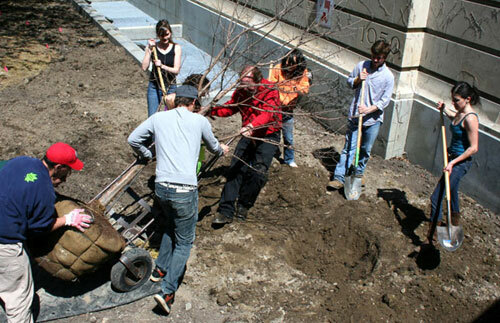 While the timing was coincidental, students in Nina Bassuk’s and Peter Trowbridge’s ‘Creating the Urban Eden’ course (HORT/LA 4910/4910) installed a new landscape in front of Mann Library on the 40th anniversary of Earth Day. As a capstone experience, the class (aka Woody Plant Selection, Design and Landscape Establishment) transforms an area of campus. Recent renovations include the Mann Library courtyard, the north side of Plant Science Building, the west side of Roberts Hall, and the George Good Memorial Garden on the south side of Plant Science. Wheeling a tree into place. From Melissa Kitchen, Flower Bulb Research Program. Event: Stroll our blooming bulb labyrinth! When: This Saturday April 24, 11am – 1pm. Details: 15,000 daffodils, tulips and grape hyacinths are planted within the classical Cretan labyrinth. The daffodils are at their peak now, with the tulips and grape hyacinths just beginning to bloom. Be sure to bring your camera! Where: Cornell’s Turf & Landscape Research Center, fondly known as Bluegrass Lane. Directions: From Warren Road, turn onto Bluegrass Lane, near the Robert Trent Jones golf course. Turn left at the second dirt road. Follow road to the end. Read more about the flower bulb labyrinth. If you’ve ever thought how great it would be to create art inspired by the flowers in your garden, here’s your chance. Marcia Eames-Sheavly will be leading two online botanical illustration courses June 7 to July 25. Botanical Illustration I: Basic Drawing Techniques is designed for beginning artists of all ages and from all walks of life — from current students, to those who haven’t taken a class in a very long time. More about the drawing course. Botanical Illustration II: Working with watercolor is for the beginner at watercolor, but it does assume a comfort level with drawing. (We strongly suggest you take the drawing course first.) We will focus on primarily simple subjects, such as a single stem of a flower, a fruit, or a vegetable. More about the watercolor course. Enrollment for each course is limited to 20 students. Assist with soil sampling, laboratory soil analyses, and data entry into Excel spread sheets for research project focused on evaluating various approaches to farm- and landscape-level soil carbon analysis and accounting for emerging carbon markets. Some experience with field research, lab methods, and computers preferred, but training and oversight will be provided. Must have a valid NYS drivers license, ability to lift 20-40 lbs, be willing to work in field under varying weather conditions, and also willing to work in lab and office settings. Interested applicants should contact: Dr. David Wolfe, dww5@cornell.edu or 607-255-7888. The Cut Flower Program in the Horticulture Dept. 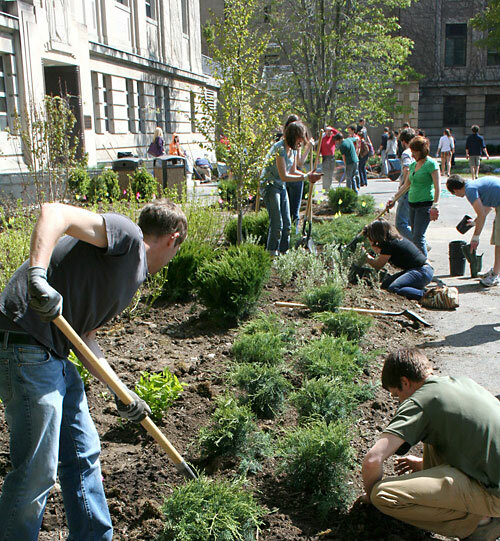 is seeking a summer assistant to help in the planting, maintaining and harvesting of cut flowers on the Cornell campus. Duties also include operation of simple scientific machinery and data collection. 20 to 30 hours per week, beginning in late May. Salary depending on experience. Interested persons should contact Dr. Chris Wien (hcw2@cornell.edu) and be prepared to provide a resume, and names and phone no’s of two previous employers. These cultivars are unique and delicious, they have resistance to common disease problems, and they produce high yields in upstate New York and beyond. Proceeds from sales of these special seeds benefit Synapsis, the graduate student organization of Cornell’s Department of Plant Breeding and Genetics. Also: Our cider sale continues (buy one, get one free half-gallons and gallons) and many apple varieties are also buy one, get one free. Spend $25 and get a free reusable Cornell Orchards shopping bag. Open Tuesday – Saturday, 8:30 a.m. – 5:00 p.m. through early May. Directions and more information at the Cornell Orchards website. Seed packets are also available at Manndible Cafe in Mann Library.